Adorned Candle Boutique presents 'Angelic Lavender'. 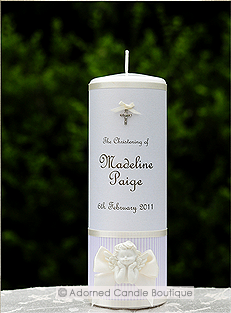 This Christening candle is elegantly adorned in a soft lavender and white pearl striped pattern, trimmed with three ivory satin ribbons and features a lovely angel accent set atop a large ivory bow. It is finished with a petite bow holding a dainty diamante cross. Your personalised details will be displayed in a French style script, set on a white pearl background. Perfect for any occasion.